Bears ripped into mining and metals stocks on the first post-summer trading day in Europe and North America on Tuesday on worries about the robustness of the Chinese economy and the impact of the top commodity importer’s widening trade war with the US. Copper touched a low of $2.58 a pound ($5,688 a tonne) on the Comex market in New York, down more than 3% on the day to levels last seen June last year. The correction in the price of the bellwether metal has been swift – a decline of 22% or $1,650 a tonne from multi-year highs reached barely three months ago. 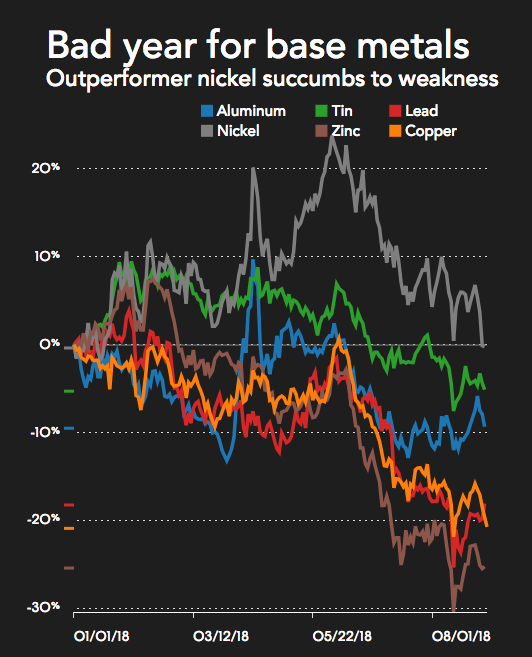 After outperforming the sector, nickel is now also trading in negative territory for 2018 while fresh falls on Tuesday saw zinc’s losses so far this year top 25%, the worst performer among base metals. Top copper producers all declined with US-based Freeport-McMoRan down nearly 4%, Toronto’s First Quantum Minerals losing 5.7% and Peru-focused Southern Copper Corp dropping 3.2%. Among the diversifieds Rio Tinto lost 3%, but BHP fared better containing share price decline to below 2% on Tuesday. Chinese manufacturing data released on Monday showed activity slowing to a 14-month low on the back of subdued domestic demand despite a rise in output. China’s export sector was particularly weak with a PMI reading below 50, indicating contraction. The slowdown in China is already weighing on sentiment in global commodity markets. We think the downturn has more to do with earlier policy tightening than the escalation in trade tensions with the US, but this may also be a factor if it leads to a material dip in activity. As such, for now, there appears little likelihood of much recovery in the prices of industrial commodities prices in 2018.